One hundred and twenty years ago, on November 14, 1893, the first of two fires burned at the Howard Mill. The flames consumed 2.5 million feet of lumber in the lumber yard, though the mill itself was saved. Then, a scant three months later, a second fire burned down the mill itself and all its machinery with it. Some landmarks are so obvious to early citizens that no one bothers to mention where exactly they are located, and later generations end up with a mystery. Confusing the issue is that there was more than one Howard Mill in the area, all owned by the Howard Lumber Company. For certain, there was one on Connor’s Point in Superior in the earliest days. Another may have been on the Lester River somewhere. The one that burned was located “back of Woodland,” and its location can only be traced by clues indicated by the now nearly disappeared Old Howard Mill Road, vague maps, and oral history. Old Howard Mill Road was once a major thoroughfare that began on an early Howard property located near 36th Ave East and the lakeshore. It started as a wagon trail that went from “Howard’s Meadow” on up the hill and was originally referred to as “Howard’s Road.” Eventually it became the Howard Mill Road, and its remnants now exist in three parts. The first and most prominent is in Congdon Park, running straight north from East Fourth Street and ending at Rustwood Lane. Before it was swallowed by the Northland Country Club golf course, the road angled northeast across the top edge of the course and crossed Glenwood Street. A short stretch of the road remains north of Glenwood today, a dead end leading to two homes. Satellite views show that the Howard Mill Road then headed north, criss-crossing and eventually swallowed by the current Jean Duluth Road. It then turned west at today’s Martin Road. The third existing bit of Old Howard Mill Road is now simply a driveway serving businesses near the quarry. (The now defunct Martin Road Auto Body and the current Dirt Factory may be familiar to readers.) The road continued in a northwesterly direction across that section, until it ended at Riley Road, a bit east of the intersection of Riley and Eagle Lake Roads. Because we know that sawmills of the era demanded a nearness to water for power, we can speculate that the mill itself was probably located on the northern part of the current quarry property, along Amity Creek. The road didn’t acquire its “Old” adjective until some time after 1918, when it truly was a disused, disconnected nothing of its former usefulness, and Jean Duluth and Snively Roads had replaced it as the main thoroughfares for the area. Confusingly, the vast land holdings of the Howard dynasty in the area led to the naming of the Howard-Gnesen Road as well. So who were the Howards? 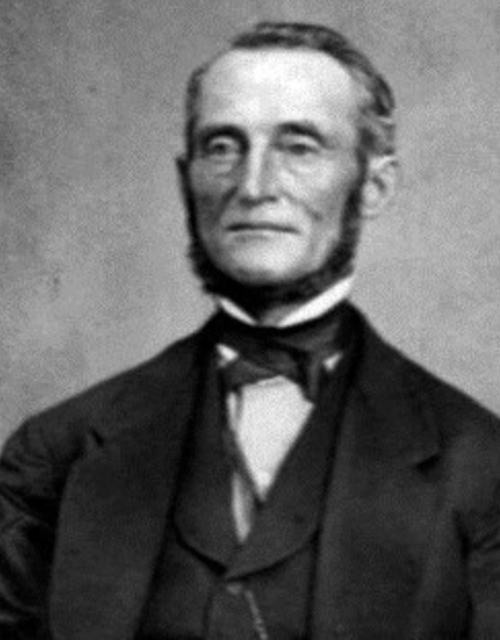 John Dow Howard was one of Duluth’s most successful settlers, a merchant from New Hampshire. In 1854, according to Burnquist’s Minnesota and Its People, he set out for Pike’s Peak—but when he landed in Superior, he liked it so much he had to stay. He brought his young family west and opened a general store before investing in lumber and real estate, eventually owning large portions of both Duluth and Superior. 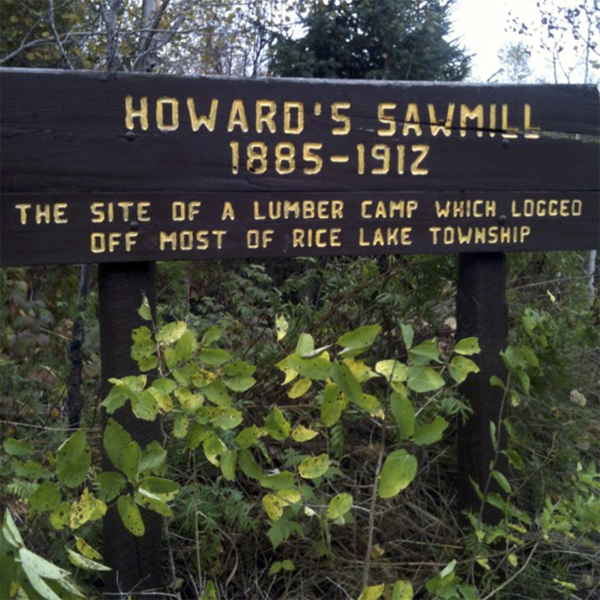 At least one source alleges he operated the first saw mill in Duluth Township, an achievement usually credited to Roger Munger. He also founded Cloquet, Minnesota, and the Portland portion of Duluth and was a major funder of the Vermillion Trail. Joseph E. Knowlton says he persuaded John D. Howard, independent candidate for the Senate and ‘cosmopolitan in my general style’ from punching the editor of the News last week. Mr. Knowlton will please accept our thanks for services rendered, and command us to any extent. Howard’s early failures in politics may have also been in part due to poor social and public speaking skills, though his supporters disputed that assessment. He was said to be “shrewd” and “diligently looking after the interests of John D., first last and all the time.” Supporters replied with a reminder that “when Duluth was in her extremity he freely furnished timber for the canal and dyke without questioning her ability to pay for it” and was repaid in bonds that quickly depreciated. Old Man Howard was known to go about town dressed in buckskin boots and homespun clothing, despite his vast wealth. An 1871 article in the Morning Call reported he owned 11,000 acres of land in the Twin Ports, and “probably not much short of half a million dollars.” That’s about $9.5 million in today’s dollars. He became a mortgage lender early on, and woe betide the man who fell behind in his payments—the newspapers frequently noted lawsuits against men who owed him money, including on occasion the City of Duluth itself. After his death in 1891, family scandal came to light during the dispensation of his will. His wife was already dead, and he left five sons and one daughter. One of those sons, Edward, was disinherited almost utterly and left a mere $100. His daughter Ida was left $200 a year for life. His other four sons inherited his fortune and business interests. Newspapers blamed a gambling problem for Edward’s diminutive cut of the family wealth; however, one newspaper account asserted that John D. had been abusive to his wife Hannah, and Edward had always defended her to the point of fisticuffs. Ida had apparently committed the crime of marrying against her father’s wishes. Luckily for Edward and Ida, the brothers in good standing were willing to disperse their inheritance more equitably. Rhodes went on to testify that he’d burned down some vacant rental cottages for John G. at his request in 1882, and that he’d participated in the first fire at Howard’s mill with Edward, after which they’d fled, shooting a man they suspected of following them on the way. On the stand, John G. in turn accused Haynie of the arson and ridiculed the idea of the cottage arson because his insurance payout had been inadequate. He denied knowledge of the mill fire, but did admit his brother Edward had accidentally shot a man he thought was a deer—and had paid the man’s medical expenses. John G. was involved in another scandal and lawsuit in 1907 involving the “Duluth Social Club,” a private poker room he operated on the ground floor of the Torrey Building. A saloonkeeper sued for over $3,000 he was owed in winnings, which caused John to turn around and accuse the saloonkeeper of running a place where prostitutes conducted business and “Finlanders” could expect to be cheated. Despite these titillating tales, John went on to be a key developer of the Iron Range. Eldest brother Benjamin was an alderman for the First Ward in the 1890s and made his living in Great Lakes shipping and lumber. He was the primary owner of the Howard Mill when it burned. At the turn of the century, he moved his lumber interests to Manitoba and was responsible for the sale, dismantling and removal of the mill to New Iceland, near Winnipeg. Third brother Julius was Duluth’s postmaster during the 1890s until he sold out his interests in the family business and moved to New York City. Youngest brother Jay Cooke Howard was arguably the most influential of the entire clan. He became deaf at age eight due to spinal meningitis, and attended the Minnesota School for the Deaf, graduating at the top of his class. He went on to Gallaudet College and returned to run his business interests in Duluth. He became a nationally influential leader for Deaf rights and those of all disabled people, especially advocating the use of sign language in opposition to “oral language” trends. He married four times. His third wife Petra Fandrem Howard was also deaf and active in the D.A.R. and suffrage movement. She became the first female president of the Minnesota Association of the Deaf and the first deaf vocational rehabilitation counselor in Minnesota. There is a residential therapeutic center named for her in St. Paul. The Howard family monument is located in Forest Hill Cemetery.